Willie 'The Worm' Monroe scored the biggest win of his career on this day in 1976. The victory was an emphatic and clear-cut, 10-round decision over Marvelous Marvin Hagler at the Spectrum, before just 3,459 die hard fans who braved a snow storm to watch the fight. Hagler, then a very hot prospect, made his Philly debut just two months prior when he lost a close decision to Bobby 'Boogaloo' Watts at the same venue. Infuriated by that loss, Hagler jumped at the chance to replace Vinnie Curto who pulled out of his fight with Monroe. However, this bout was far different than the one with Watts, as Monroe administered a pretty good beating on the future superstar. To this day, the loss to Monroe is the only one Hagler ever admits to. But Hagler's business wasn't finished in Philadelphia. 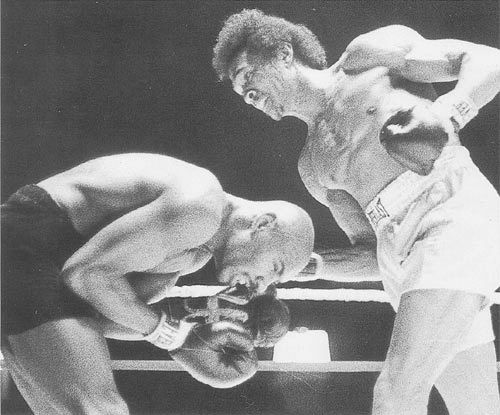 Marv returned in September to score a TKO win over Cyclone Hart, and then in 1978 beat Bennie Briscoe over 10 rounds. Monroe & Hagler faced off two more times with Hagler winning both bouts by TKO.